I have never been to Africa before in my life, so when the opportunity arose to spend three weeks in Kenya for a clinical rotation in my final year of veterinary school, I didn’t hesitate. I applied to the “Smallholder Dairy Kenya Rotation” which the Atlantic Veterinary College offers in cooperation with Farmers Helping Farmers. I am really happy that I was selected as one of the three student to go to Kenya. The three weeks in Kenya flew by in a heartbeat. We worked with many dairy farmers, held several seminars and treated hundreds of animals (we dewormed more than 500 animals and almost 100 medicine consultations during a walk-in clinic day). In those three weeks, I learned that Kenya is an amazing country full of unleashed potential. Kenya is located on the equator and its area is a little bit smaller than Manitoba, however about 45 million people live in Kenya (MB has about one million). Due to the topography around Mount Kenya, Kenya has some areas which are highly suitable for agriculture, including dairy farming. The soil is rich and rivers have water year around due to the Mt. Kenya glaciers, which allows for irrigation of fields during the dry season. The population is large and hence a strong labour force for farming is available in theory - the question here is if people are willing to work as a farm hand. Just like in Canada, finding and retaining good farm hands can be a challenge. On the other hand, land or plot size can be a limiting factor. One of the reasons why the plot sizes have diminished over the years is that the land of the parents has been divided amongst the children, and therefore the plots became smaller and smaller. For example, during a seminar we were asked by a lady how she can keep a dairy cow on a quarter acre. With perfect management, excellent zero-grazing stall design and neighbours that allow fodder grass to be grown and harvested on their land – it would be possible to do dairy farming on a quarter acre. In reality, a better option would be to keep goats, chickens and/or potentially one or two pigs, and use the rest of the land for horticulture. Another major limiting factor is the level of education. Although Kenya subsidises primary school education today, not everybody in a community understands and can read or write English fluently, especially when you consider that English is usually their third language (they first learn a tribal language, then Swahili, then English), only 2/3 of children can go to secondary school, 1/3 can attend college or university. Here is where the work of the organization FHF can be beneficial. FHF has a working relationship many Kenyan dairies (most of them cooperatives) and also has two permanent dairy staff members, both of whom are excellent translators and educators. Add in the expertise of Dr. John van Leeuwen (professor at the AVC) and three to five senior Canadian and Kenyan veterinary students, and a seminar can provide a lot of hands-on and practical information for the farmers. This vet team effort aims to change the lives of Kenyans by empowering them through education on such topics as dairy farming and cropping. 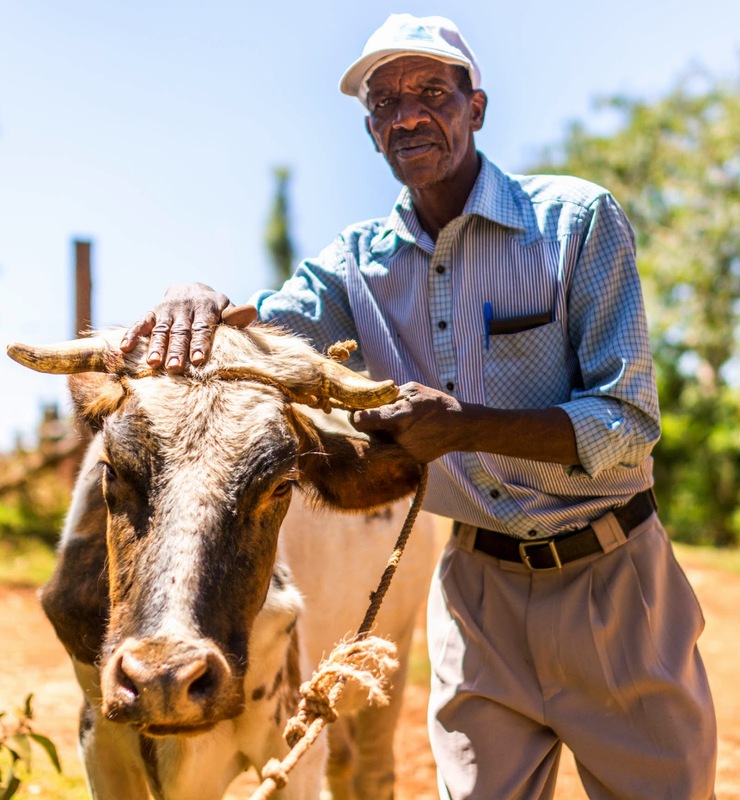 Once such education is implemented, there can be positive benefits to the farmer, including an increase in the sale of milk and consequently a more sustainable income. This income can be used to keep more cows, build a better farm and home, get an electric power hook-up, and buy equipment that saves on manual labour (such as a silage chopper). Additionally, it allows parents to send their children to school and eventually for higher education, providing them the opportunity to pursue careers that bring in more income. The income generated on the farm also benefits the local economy, supporting local stores to flourish and the growth of service sectors in the local village or town. As the individual farmers and their cooperatives are getting bigger and the economy becomes more stable, several spill-over effects can be observed: a larger community is in need of specialization and this creates jobs in feed stores, vet services, equipment sales, banking, schooling, and so on. The additional income in the community can then allow for the establishment of programs like “milk for school pupils”, which gives milk at a reduced price or free to schools in order to feed pupils a nutritious meal throughout the long school days (up to 12 hours a day if you include transport to and from school). This milk program helps the pupils to be more awake and achieve better marks. It also helps increase market demand for milk, not only from the schools but also from the next generation of milk drinkers. All these positive effects have several requirements. The most important requirement is that the individual farmer is managing the farm and livestock well. There is also a need to cooperate with the neighbours and local dairy cooperatives. One person alone can’t do all the change by oneself; by cooperating with others, synergies can be created, such as good working relationships with a veterinarian or animal health technician, NGOs (such as local women’s groups), and government agencies (such as agricultural departments). The idea of dairy cooperatives allow dairy farmers to have a stronger, united voice that can be heard by the various levels of government. There are many risks within the dairy farming sector that farmers deal with, either directly or indirectly. In addition to the troubles which sometimes present when trying to sustain cooperatives, the bigger risk may be that of large multinational corporations. These corporations could perform a land grab and build-up a large “factory-farm” style dairy operation on the most fertile plots of land in Kenya. History shows that this can be achieved through corruption, such as bribing those in a position of power, allowing them to buy out local farmers of their land. Another looming scenario that is happening is climate change. As mentioned before, most of the rivers in central Kenya are fed by the Mt. Kenya glaciers. Once these glaciers recess and disappear, less water would be available during the dry seasons, when irrigation is critical. Those drought periods could be offset in part by installation of water collection devices during the rainy season, but this comes at a cost. Security concerns are also a ubiquitous problem: Virtually every home is fenced in or has a wall with barbed wire or broken glass, and public life slows down significantly during the night. Every door in the house and surrounding buildings are locked at night. There are reports of stolen animals when premises were not locked up at night. The lack of education can also jeopardize the progress of small holder dairy farmers. Local animal health professionals are still identifying best practices when it comes to housing and feeding animals in the Kenyan climate. The key here is to continue applying training from professionals in the field, allowing them to implement timely and effective change. As Kenya is still a developing country, we have to be mindful of certain concepts which may not be as easily implemented or accepted in the Kenyan context. For example, cow comfort may be perceived as giving the cow a better sleeping arrangement in its stall than its owner has in his/her home. All in all, Kenya is for me a country of magnificent beauty, good hearted and hardworking people. Kenya has so much to offer and this country has considerable unleashed potential. Travelling through Kenya reminded me of what the Western World may have been like 100 years ago; small villages, dirt roads, and manual labour. All the signals of the “olden days”, but with the added benefit of today’s technology and fruits of recent research. Almost every Kenyan has a cell phone and the knowledge can be nourished by access to the internet via mobile network. The people I met in Kenya are highly motivated to learn and they want to improve their life and the life or their family. I really hope that the Kenyan farmers are able to continue to rally together and receive the help of FHF to create a prosperous society of happy dairy farmers and rural communities.